Looking to buy Halloween contacts online? Shop more than 350 unique designs in the world’s largest collection of non-prescription Halloween contact lenses. 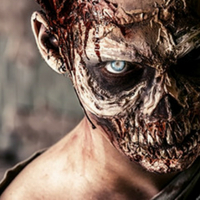 Bringing witches, wizards, zombies and demons to life with terifyingly realsitic eye colour transofrmations, they are the ultimate accessorry for anyone attending a haunted house, ghostly walk or Halloween party on October 31. Anticipated to be one of 2019’s hottest Halloween accessories, there’s a pair of colored lenses to match any theme. So, whether you’re preppring a zombie costume for an apocalyptic ball or you’re attending a fiend’s movie themed party as Pennywise from the hugely anticpated IT 2 movie, we’ve got a pair of Halloween contacts to take your costume from DIY-esque to Hollywood legend. Used by TV and movie production companies, A-List Halloween revellers and alternative models for decades, Halloween lenses are cheap to buy and easy to fit, yet offer one of the quickest and most extreme eye transformations imaginable. Talking of movies, we’ve built up a mind-boggling selection of movie contact lenses that have been expertly designed to replicate the eyes of some of Hollywood’s best loved and most feared characters. For example, we’ve got our bestselling Black Mini Sclera Contact Lenses for Michale myers fans and Darth Maul Contact Lenses for Star Wars fans. That’s in addition to designs for Hulk, White Walker, Maleficent and The Nun. Aside from our non-prescription Halloween contacts, we’re also proud to have introduced an extensive new range of prescription Halloween contacts for the 2019 season. Enabling those with impared vision to participate in the Halloween madness, the entire range is available in the following power ratings: -1:00, -01:50, -2:00, -2:50, -3:00, -3:50, -4:00, -4:50, -5:00, -5:50, -6:00, -6:50 and -7:00. Epic eye transformations aside, one of the most important considerations when buying Halloween contact lenses is safety. There’s been a whole plethora of press that focuses on the dangers of wearing them. However, the reality is that more than 45 million Americans wear contact lenses and eye complications among them are extremely rare. In order to ensure optimum safety, our designs are all printed on soft lenses (the type of lens worn by 90% of US contact lens wearers) at our UK based manufacturing facility, you won’t find any cheap and nasty imports here. Meanwhile, we only use FDA approved dye, comply with the standards outlined in the EU Cosmetics Directive and frequently commission independent tests to ensure our lenses are safe for everyday use. 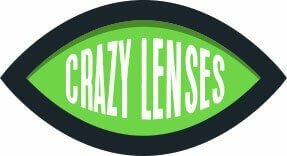 You should clean your reusable lenses in contact lens solution after use and store them in an appropriate case when not in use. We recommend using ReNu Multipurpose Contact Lens Solution. You should immediately remove the lenses, discontinue use and seek advice from a qualified optometrist or eye doctor if your eyes become sore, red, itchy or if your vision suddenly becomes blurry or distorted. You should not under any circumstances wear a pair of lenses that have reached their expiry date. 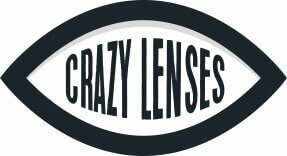 You should also note that the lifespan of your lenses (i.e 90 days) begins from the day the seal is broken on the blister packaging and is counted as 90 calendar days, not 90 individual uses. For example, if you only wear them once a month, they will still only last for three months. You should not share a pair of lenses with another person due to the risk of bacteria or infection being transferred between eyes. Blind White Contact Lenses – Our all-time bestselling Halloween design, blind white, completlely transforms your iris and pupil into a white block of colour. Ideal for zombie, Walking Dead, undead and possessed makeups and costumes, caution is advised as they will reduce your vision by around 80%. Red Contact Lenses – Red contact lenses are incredibly diverse. Featuring a red block of color with a central black pupil, they can be used as devil or demon eyes as well as vampire and werewolf eyes. Volturi Contact Lenses – Our Volturi lenses are based on the eyes of the Volturi coven from the hit movie franchise, Twilight. Featuring a blood-red design with dramatic black markings and a central black pupil, they feature among our bestsellers year-after-year. Penywise Contact Lenses – With the September release of IT 2, our Pennywise Halloween Contacts are set to be one of Halloween 2019’s bestsellers. Featuring a striking red, orange and yellow design, they’re a must have for those looking to create a horifyingly scarey clown makeup or costume. Pentagram Contact Lenses – Pentagram lenses we’re a surprise bestseller in 2018 and the expectation is that they’ll continue to be in deman for the Halloween 2019 season. Featuring a black background with a red outer ring and red pentgarm outline, they are ideal for use in SFX makeups.